CAHP program participants can earn a bonus incentive kicker for installing home energy management systems (HEMS) in new homes. Read on to learn how to earn the kicker and how HEMS can add value to new homes. HEMS allow for monitoring, measuring, and controlling multiple end uses including appliances, HVAC, hot water equipment, and plug loads throughout the home. 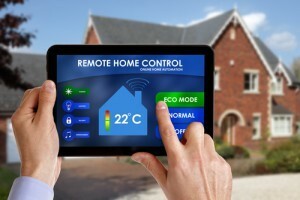 Note, HEMS can refer to a standalone technology, such as a singular smart thermostat, or a suite of interconnected components, which are interoperable to enable either or both of the following methods. HEMS provide homeowners a high degree of control over energy use in the home, and allow homebuilders to market units as energy efficient/green. CAHP offers a point kicker for HEMS, allowing homes in inland climate zones (CZ 1, 2, 9-15) to gain an extra 0.5 Delta EDR point, and homes in coastal climate zones (CZ 3-8 and 16) to gain an extra 1 Delta EDR point. Participants can use this bonus incentive both to meet the eligibility requirements as well as to achieve higher incentives for CAHP projects. There are two ways to qualify for the incentive kicker, install a HEMS system in the home or pre-wire the home so that the owner can install a system as they desire. To qualify for the incentive kicker, all installed HEMS must meet the following criteria. Feedback: The unit must provide occupants real-time energy use data and prompt users to reduce energy use. The unit’s user interface must allow users to access the home’s current and historical energy use information. The user interface may be built into the device that collects energy feedback (embedded), an independent wall mounted or portable display (autonomous), or HEMS can present data via existing channels such as a utility bill, website, computer software or phone (distributed). Control: The unit must allow automated control of energy-consuming appliances and equipment in the house. The device must be programmable and should allow users to override or turned off the device. Additionally, the HEMS must also be demand response capable to be eligible for the kicker (demand response program participation is not required). An alternative pathway to qualify for the kicker is to wire the home such that no appliances, equipment, lighting loads, or plug-in devices (including but not limited to: dishwasher, dryer, refrigerator, clothes washer, oven, whole house fan, furnace/heat pump, water heater, sump pumps, etc.) share a common circuit. In other words, any one circuit should only be serving either a lighting load, a plug load, or a single major appliance/equipment (ceiling fans with lighting should be counted as a lighting load). Visit www.cahp-pge.com to learn more about CAHP or contact a program representative: via phone at (866) 352-7457 or via email at cahp@trcsolutions.com.